This image is so appropriate for a movie about a guy who split his personality after failing to take his life. I had to admit that the quality of this movie and it's message blew me away. It was nothing like what I had imagined. The premise is a guy who deals with depression by using a beaver hand puppet to communicate with people - and I think that it really worked. For sure the subject matter is quite dark and there are a few scenes that are really disturbing. Yet I thought that it was a unique story about how devastating depression can become to a person and their family. 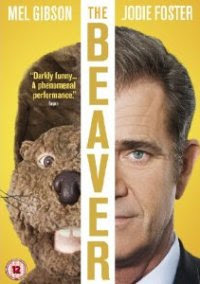 It is hard to imagine anyone doing a better job than Mel Gibson in the lead role - he made it believable and gave the beaver a creepy yet funny persona. Also thought Jody Foster did a good job playing off Gibson as his wife. I liked it and, on a scale of ten, I give this one ★★★★★★★★. Have to admit I'm not much of a movie goer but this one sounds quite interesting. I have always liked Mel Gibson's acting. Now if I could just get my Hubby to the movies, I would be one happy camper. Thanks for the comments on my blog. I really appreciate them. Thanks for the note Sue. The movie is pretty dark but fairly engaging.